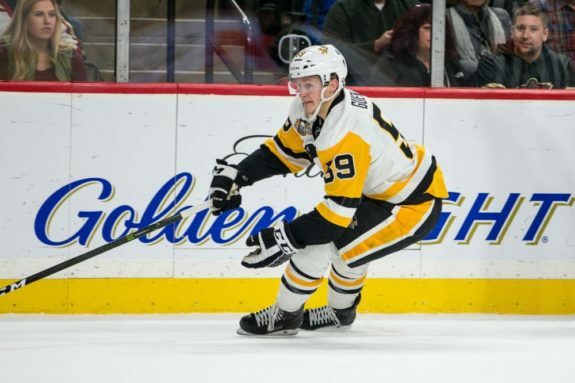 Pittsburgh Penguins: Is Guentzel Surging at the Right Time, Again? 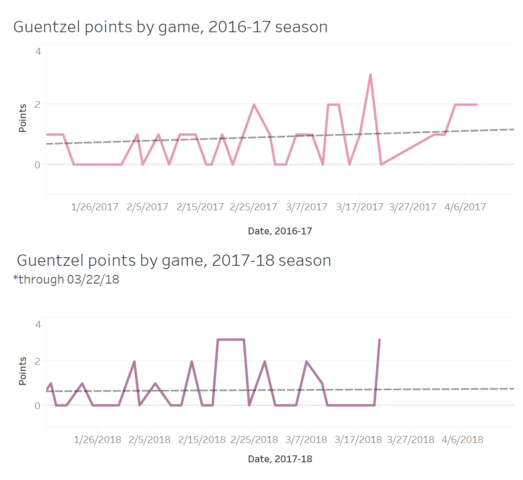 Guentzel Surging at the Right Time, Again? Jake Guentzel saw his first NHL call-up and received his first Stanley Cup ring all within in the same season. 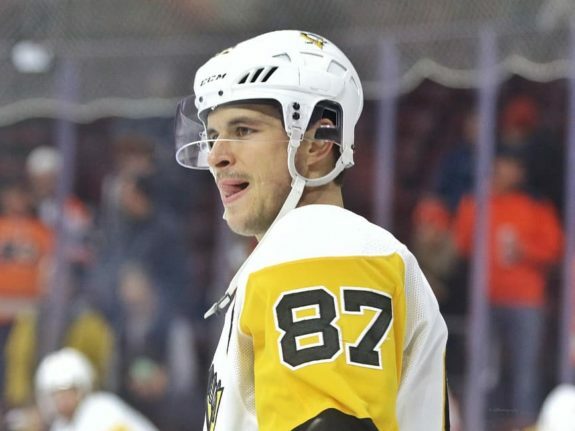 In the 2017 playoffs, he was a rookie standout for the Pittsburgh Penguins with 21 points in 25 games, earning him a permanent roster spot and a Conn Smythe vote from the NHLPA. Even within the 21-point playoff run, Guentzel was a streaky producer. After five goals in the first round, he scored only two points in the Penguins’ seven-game third-round series against the Ottawa Senators. He’s struggled with similar downswings in the regular season. Guentzel has been on a relative downturn lately. His three-point effort against the Montreal Canadiens on Wednesday, for instance, tied his point production in the nine games prior to that match. But things could be about to trend upwards for Guentzel. Guentzel is still playing his first ever full season, so sample sizes to judge from are small. But the 23-year-old’s production last season showed that he had the ability to get hot at exactly the right time in the year. If his performance against the Canadiens Wednesday is any example, Guentzel could be trending once again in exactly the right direction with the playoffs waiting just around the corner. In the 2016-17 season, Guentzel started seeing regular playing time right around the end of January. As he spent more time with the Penguins, his point production started trending upwards. He tallied multiple points in a single game, for the first time since his stunning two-goal debut in November, at the beginning of March. Then through March and into April of 2017, he continued to trend upwards with momentum that carried him into the playoffs, where he promptly put up six points— including five goals, one an overtime game-winner— in a five-game first round against the Columbus Blue Jackets. 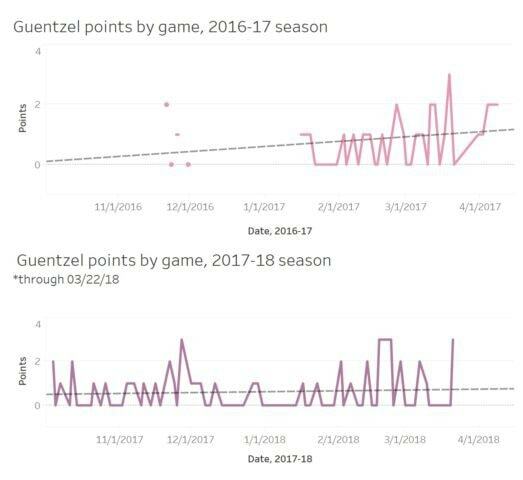 Guentzel’s points plotted over each of his two NHL seasons. His production trended upwards as his rookie spring progressed, and he is seeing a similar (although much less dramatic) improvement his sophomore spring as well. Stats from hockey-reference. What’s interesting in the 2018 half of the season is that his production is peaking at almost exactly the same time it did in 2017. It’s the end of March, and Guentzel has just put up a three-point game, just as he did at the end of March in 2017. When looking at his points plotted over the course of the season, it looks like his performance is trending upwards after a relatively flat January. And if last year translates, that will mean good things for Guentzel heading into the playoffs. A closer look at each of Guentzel’s springs in the NHL. His rookie spring was defined by a definitive upward trend in production that carried him directly into the playoffs. In the Penguins’ final games of the 2017-18 season, he will try to see if he can imitate that once again. Stats from hockey-reference. Related: Is Daniel Sprong Sidney Crosby’s Next Jake Guentzel? Why should we have faith that this trend could mean similar things to what it indicated last year? Two words: Sidney Crosby. It’s no coincidence that Guentzel’s production has started to increase as he’s started to get more ice time with Crosby on the first line. We’ve seen it from both Guentzel and Conor Sheary this season that wingers’ production suffer, unsurprisingly, when they’re no long playing on Crosby’s wing. The first line of Rust, Crosby and Guentzel that the Penguins have been deploying in March is one of their most dominant possession lines, with a Corsi For % on the year of 57.18. If Guentzel is producing on the first line, then he could make a case to stay there as a longer-term option. And we know from last spring that Guentzel has the ability to get hot at the exact right point in the season. That point is right now— so let’s see if his dominant performance against the Canadiens carries any weight in how he produces heading into the last stretch of the season.